Two or three weeks ago a sign appeared beside a road near my house: “FREE FIREWOOD” and a phone number. Firewood is selling for upwards of $300/cord around here these days and I don’t have a truck for foraging deadwood in the backcountry, so I was dialing that number on my cell about thirty seconds after I read the sign. The man who answered explained that he had just cut down 500 apple trees and was getting ready to cut down 500 more, and that he just wanted them off his property. And he lives within a couple miles of me! I said I would definitely be getting back to him soon. Then I ran through the list of people I know who own pickups, trying to decide who would benefit most and be least inconvenienced by throwing in with me in this venture. The obvious answer was Steve: his parents heat their house with woodstoves, he has a truck and he lives just up the road. So I called him and said I could score us both all the free firewood we wanted, if he’d provide the pickup and delivery. He said it sounded like a great deal, and we should plan to do it as soon as he could find the time. Of course, the time never materialized and eventually I grokked that Steve had no actual interest in picking up apple trees. I’ve no idea why he can’t just SAY he’s not interested, but I guess that would be too simple or something. My friend Dee, who is one of the ladies in my walking group, came to check out my church last Sunday. It was a COLD COLD day, and after the service I was whining to her about how it was just plain wrong to have to fire up my woodstove this early in the year and how my store of firewood was never going to last the winter at this rate and blah blah blah. I lamented the apple trees, just sitting there less than two miles from my house and yet out of my reach. Dee, who doesn’t have a woodstove and who lives WAY across town from me, said that her husband has a truck and that he would be happy to help me load up some apple trees. And three days later there we were in the remains of what was once a fine apple orchard. We all had a collective “HMMMMMM……” moment when we saw the trees. For one thing they were older and bigger than we were expecting. I don’t have a chainsaw, and my little Sawzall was no match for those massive trunks. For another thing, they hadn’t been CUT down, they had been BULLDOZED down, roots and all. There was no way we could lift even one of those monsters into the pickup bed. Luckily there had been people with chainsaws there before us, and they had already cut up a couple hundred of the trees: they had taken the trunks and left the roots and branchy tops. 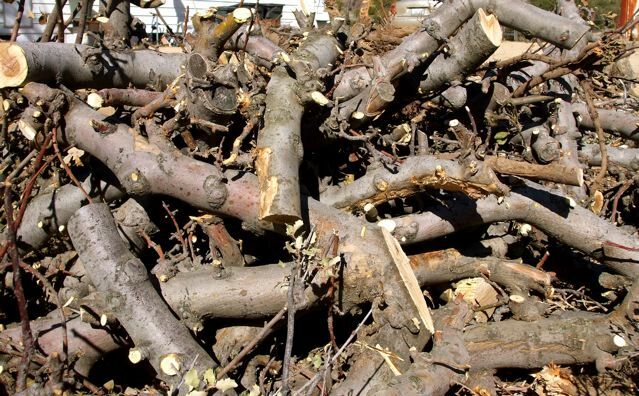 This suited me fine; I threw several nice stumps into the pickup bed and then started tackling branches with my heavy-duty loppers, cutting off the twiggy stuff and keeping the solid limbs. It wasn’t an easy job, but Dee and her husband and even her elderly mother set to work with their own saws and loppers with such cheerful enthusiasm that in about an hour we had a full load of beautiful stovewood. They said they’d be happy to come back next week for another load, and waved off my grateful offer of gas money. I promised to give them a big pile of steaks when our next steer gets slaughtered later this month, and they happily accepted that. WIN/WIN! There’s an old saying, “He who cuts his own firewood warms himself twice,” and I’ve always smiled at the truth of that statement. But yesterday I was warmed in a whole new way. These kind and generous people saw a need that they could fill, and they immediately stepped in to fill it even though there was nothing in it for them. And I have a freezer-full of beef arriving in a few weeks, so I’ll be able to repay their kindness. That’s the way a community should work, isn’t it? Friends looking out for each other. People sharing what they have plenty of and receiving what they need. It warmed me even more than that new stack of applewood in my woodpile will. Happy Love Thursday, everyone. May we all find ways to enrich one another’s lives and share in the everyday blessings all around us. It is in times such as these that show us the truth of friendship…community…and the human spirit. For better or worse. It is nice to hear that you have been warmed, from your heart to your tootsies. What a wonderful story. Happy LT! Happy Love Thursday. Your home is going to smell so wonderful with that apple wood. I wish I had a wood stove. You are lucky to have such a wonderful friend! Happy LT! This is such a wonderful story! And YES! this is how communities should function! Thanks so much for sharing and happy LT!